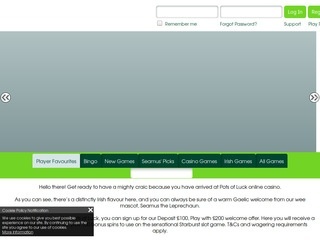 Pots of Luck Casino will then reward you with a bonus (Welcome Bonus is for new players only). The terms and conditions of the bonuses vary between different casinos and might also change over time and between different countries, so it is important to compare the different offers and read the T&C for Pots of Luck Casino before signing up. 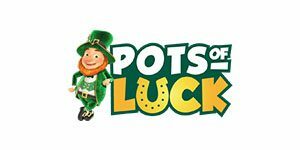 Pots of Luck is an Irish-themed online casino that appeared in the market in 2016, presenting the players with a versatile gaming offer inside SSL-encrypted environment. Owned and operated by Nektan Ltd, the casino is regulated by Gibraltar Regulatory Authority and UK Gambling Commission, providing RNG certified games tested by NMI. The return to the player percentage for each of the gaming categories is regularly updated and published under Fair Games section at the bottom of the page. Pots of Luck is also present on the social media and you can connect with the casino on Facebook and Twitter. Pots of Luck stays true to the Irish theme by introducing two extra categories: Seamus’ Picks and Irish Games. The rest of the games are classified as Player Favourites, New Games, and Casino Games. The players can also bookmark their personal favourite titles by clicking on the star in the right upper corner of the gaming screen which will immediately store the game under “My Favourites”. The previously launched releases can be accessed under “Last Played”. Players will also be able to set up the reality check feature, that will send reminders in specified time intervals and the overall casino activity will be recorded and saved under the History tab. All table and card games are gathered under Casino Games. The virtual tables will be at the top and if you scroll down, you will get to the Live Dealer Tables. The offer is pretty conventional and the players can choose from different Roulette and Blackjack variants, Oasis Poker, Texas Holdem, Pontoon and Punto Banco. Scratchcards, Bingo, and Video Poker games are included in Pots of Luck offer – however, these are not grouped under a specific category and the players will have to use the search bar to find them. Depending on the keyword used, you will come across the Ultimate Poker Five Play, Ultimate Poker Triple Play, Bingo Billions or a few scratch games – not more than that. The Live Casino lobby is accessed from the Casino Games category and the tables are streamed from Evolution Gaming studios. In addition to the traditional Roulette and Blackjack offer, the players can also explore more unique tables: Blackjack Party, Double Ball Roulette, Immersive Roulette, etc. Big spenders are not forgotten and Auto Roulette VIP, Blackjack Platinum VIP, and Blackjack Fortune VIP are among the tables designed exclusively for high rollers. Deposits at Pots of Luck are fee-free and to fund your cashier, newly registered members can use one of the following methods: Neteller, Skrill, Paysafecard, Zimpler, Trustly, VISA, Maestro, MasterCard, Sofort, etc. Boku Pay by Phone method can be used by the UK members, however, this option comes with a fee and raises the deposit limit from $10 to $15. The withdrawals are processed within 3 days and the payout can be directed to SEPA, Neteller, Skrill, Trustly, Paysafecard, Visa, MasterCard, or Maestro. Up to $10,000 can be withdrawn per day and the money will be settled on one’s account in approximately 1 to 5 days, depending on the selected payment method. If there is anything that you need to talk about with the casino representatives, you can do that in person, via phone ( 0161 870 5948), or Live Chat. Alternatively, you can send an email to [email protected] A lot of the information can also be obtained in the FAQ section and the questions there refer to account & registration issues, banking, safety regulations, etc. Written correspondence (feedback, complaints, or suggestions) can also be mailed to the operator’s Head Office in Gibraltar.